Fans are still on a high from Saturday night's AFC Division Round victory over the Kansas City Chiefs, but they doesn't mean they aren't scoping out the rest of the NFL. Many paid close attention to Sunday's game between the Steelers and Broncos, which determined the Pats would travel to Denver for the AFC Championship Game. The Foxboro Faithful came out to the Patriots Pro Shop Sunday to celebrate the big win. 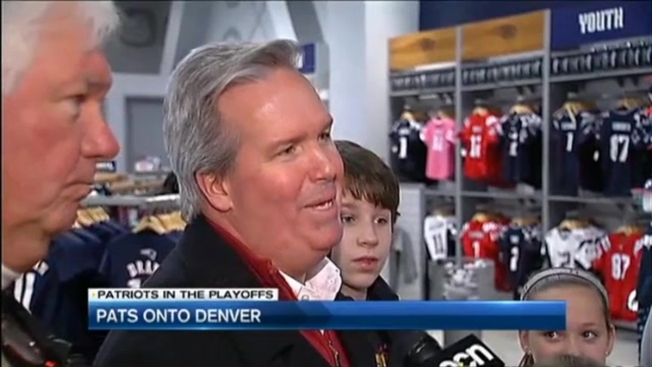 "Just pumped up about the Patriots, coming here to look at gear, go to the Hall of Fame," said Trey Knight of Wrentham. Members of the Thomas family told necn they didn't care who they would face - either way, they think the Patriots are going all the way.